Okay, so I got on the scale this morning and the damage wasn't as bad as I was expecting, a gain of 2.9 pounds. To off set that I jumped on the eliptical and burned off 364 calories. It's all give and take, you see. There's a price for everything. Big Seig is out barking at Mrs. Puff's granddaughter, who's busy putting garbage out on the curb. He'd be much quieter if she'd just walk over and pet him on the head. That never happens though. I also get to back to work today as well. For 3 days, and then I'm off again for 2. I have a fixed shift, now if only I could get a fixed schedule, well, that would be ducky. This week will, I suspect, be tumultuous for the Idiot in the White House. The problem with Conservatives is that he will have no problem if the country runs out of money. How do I know this? Four bankruptcies, at least I think that's how many he's filed. If they don't give him what he wants, he'll just let the country go broke for a day or two. He has even planned a weekend getaway to Harrisburg, which is way too close to me, as the crow flies, about 2.3 miles. 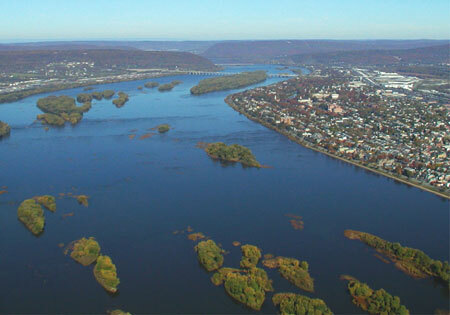 Luckily he'll be on the East Shore and a very wide Susquehanna River will create a water barrier. There will be protests, of course, and if things don't go too well for him this week, I suppose they will more raucous than ever. I actually live in the upper left hand corner, on a very high hill and the Idiot will be on the right hand side, near those white buildings. My only worry is that those Crazy Conservatives will cave and give him what he wants. Of course, that will make them look bad to their constituents, and would, pretty much, represent the defining moment of failure for their party. Just imagine, American taxpayers saddled with paying for a fence only a bunch of racists want, and a health care package that everybody knows is bad. Because it's not about what's good for America, it's all about the Idiot getting his way.